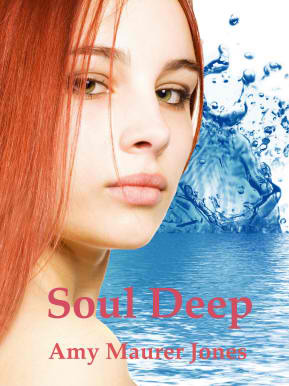 Today’s spotlight is on Amy Maurer Jones, author of the Soul Quest trilogy. Coming from a family of teachers, I can certainly respect Amy who has spent the last 17 or so years in education. It’s no wonder that she was attracted to the young adult genre. She is well versed in teen drama…she actually teaches it. Drama as in theatre, that is! She currently teaches high school Dance and Theatre Arts in her southeastern North Carolina community. Do you remember how horrified you were about the idea of attending high school? I remember ticking off those last miserable days of my summer vacation following my eighth grade year. Maybe you don’t, maybe you were one of those people. You know who I’m talking about, people like Melissa Small, the distinguished District Attorney, Larry Small’s daughter, popular, gorgeous and absolutely terrifying to someone like me, Liv Glyn. No, I am far from measuring up to the standards required to make Melissa’s crowd. I’m not even close. I’m just a simple man’s daughter, mostly tolerated by my peers with average looks. If this isn’t depressing enough for you, stay tuned, it gets worse. I was commanded with Spirit at birth by the Great Spirit, Hala. I know, it sounds crazy but it’s true. If you think it’s difficult being a teenager, try being a teenager who was born destined to save the world from soul sucking Daevas and their mutant progeny Aengels. There are four of us. My companions of Spirit are Laith, Brayan and Meena. Melissa Small is Laith’s step sister and she is always meddling where she doesn’t belong, further complicating our lives. To make matters even worse, my best friend Jedd is apparently aware of things that are typically undetectable to ordinary humans. So, I have to lie to Jedd, the boy who has been my constant standby since the third grade, to shield him from the horrible and very dangerous truth. Did I mention that I think I’m falling in love with him? The term awkward doesn’t even begin to cover it, trust me. Welcome to the mess that is my life.